Aura Loewe is Loewe’s muse. This inspiring, mysterious eau de parfum is an icon for women, with notes of rose otto, sandalwood, and a hint of Loewe's signature leather. 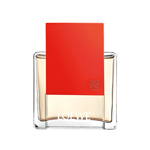 A warm tribute to Loewe’s expertise and heritage that is true to the brand’s past and present, this floral, woody fragrance is conceived for the mysterious, inspiring woman. Either you have it or you don’t.